This is by far the biggest update so far. I wanted to make sure it contained significant additions which is why it took so long. To help continued development, a price of $5.00 has been added to Windstone. Many hours of gameplay can be had with update 14 and I now feel comfortable taking it out of the free category. I appreciate all those that have already played the game for many hours and given useful feedback. 3 New Biomes have been added: Desert, Volcano and Snow. The Desert area serves mostly as a place where certain resources are abundant (agave, thorns and poison herbs) and as an area that must be crossed to enter the Volcano Biome. Within the Volcano Biome you will find buildings with loot, obsidian harvesting nodes, dangerous lava flows and most importantly the Red Dragon Keep, which houses the Red Dragon egg. The Snow Biome covers nearly the entire northern quarter of the Island. Many pre-built newly modeled stone structures are scattered around the frozen land. Temperatures are always cold, resources are scarce and only Antelopes currently roam the wild as the cold-blooded Formicans and other native creatures stay south. In this biome, survival is truly a struggle of Makaran against himself. Within the Snow Biome, high on a mountain range is the White Dragon Keep. Wolves and Bears are stirring in their dens, awaiting a future update. The separate island south west of the main island is now fully populated with resources and wildlife and also is home to the Green Dragon Keep. The Blue Dragon keep remains where it has always been. All 4 dragons can be in your care simultaneously. The Follow/Stay commands for the dragons have been modified to account for having multiple dragons. The Player must be close enough to their dragon and while looking at (placing the center dot on) the dragon press T (follow) or Y (stay). This allows you to have one or as many of the dragons follow you as you wish. As of now, the dragons do not follow you if you are flying so be sure to put your remaining dragons on Stay if you take flight on another. As a side note, the dragons are currently and primarily a mode of faster transportation and cannot die once fully grown. In the future this will be expanded, dragon combat mechanics will be added as well as quests that involve the dragons on your path to extermination the formicans and their Queen. The in-game navigation Map has been updated. When starting a new game you will begin in one of 12 spawn points at random. 5 are in the snow biome, 2 on the southern shore, 1 in the volcano biome, 3 in the central area of the main island and 1 on the south western island. All spawn points have different pros and cons. Some spawn points will offer a greater challenge than others. Stone buildings have been added to the bushcraft menu which allows you to build new stone structures in the style of the newly modeled buildings that can be found in the Snow Biome. Tutorial and quest objectives have been slightly altered for clarity and to accommodate new additions in update 14. Fixed an issue where the crafted water well could not be used. Fixed an issue where ALL shadows would disappear. Shadows can now be seen much farther away. Fixed an issue where ambient fog would cause concentric circles to appear in the sky at the center of the screen at night. Thank you for playing and please leave feedback to help improve Windstone. Originally posted @ https://threshold-seven.itch.io/windstone/devlog/50708/update-14-is-here which is also where you can get the latest version. Update 14 will include new areas to explore that consist of the large island to the south, a volcano biome to the west and a snow biome to the north. Desert and Marsh biomes are planned for the future in the east, but will not be included in update 14. These will be the first iterations of these biomes and will be expanded in the future. This will allow testing the different mechanics in the new areas and give incentive to explore more of the map. The upcoming update 14, will not include any drastic changes to game mechanics except for minor bug fixes. This update will primarily be to expand the explorable landscape and to test how the temperature change in each biome affects gameplay. Update 13 includes some bug fixes and a simple but much needed change to the building system. Building items that you place can no longer be accidentally picked up by simply pressing E. You now must double tap E to pick up a building piece. A menu may be added in the future to give to option to pick up/repair/lock in place/etc. but for now, requiring E to be double tapped quickly to pick up a building piece should mitigate accidentally picking them up when trying to pick up other items such as a tool on the floor or when trying to open a basket. There is no indicator yet in the game that lets you know that you can double tap E to pick up a building piece, but this will be added as the building system is worked on. Right clicking on a building piece will still move it and can cause accidental movement of building pieces when trying to move a basket or other item. This will be addressed in the next update. The Dragon Hatchling should now spawn when hatched even if inside a building or something is overhead. It still may be safer to hatch outside, but hatching inside will help to find any more problems. The Dragon Hatchling should now be able to navigate more effectively in player-built structures but this needs more testing. After a little break to gather feedback and wait for bug reports to safely continue development I’ve been working on Windstone again over the past few weeks. 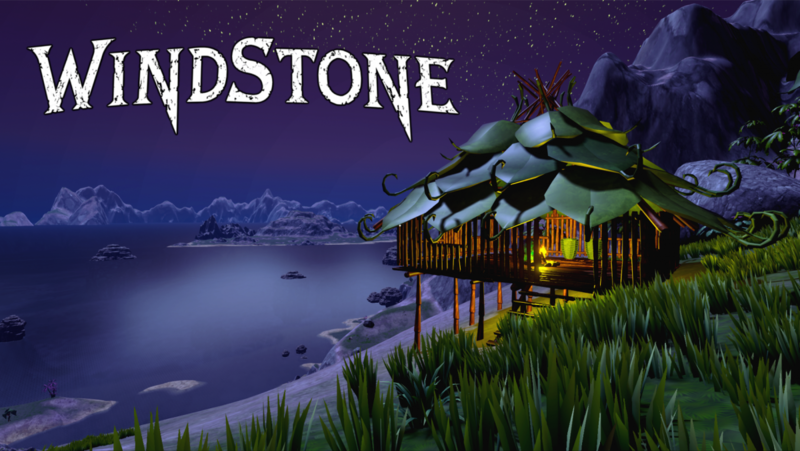 Update 12 was scheduled to be a large one but unforeseen issues have caused the necessary migration of Windstone to a fresh project file in UE4 due to compiling errors. This caused a lot of settings to revert to default and a lot of combing through the scripting and play testing was necessary to get Windstone back to where it was in Update 11 and subsequently delayed the release and lessened the planned content of update 12. There may be unknown issues caused by the migration that may not be found until more testing is done. The raft functionality was the last known issue that needed fixing and is done but it still may be buggy. Feedback on the raft will be very much appreciated. Update 12 also has a few new changes including the most requested feature: click-to-attack instead of hold-to-attack. You can simply click once to punch, swing a weapon or harvest with a tool. Additionally you can hold left click to swing your weapon or tool continuously. The Blue Cap Mushroom objective has been removed as it caused unnecessary distraction from other parts of the tutorial for many play testers. You can still find and use the mushrooms as normal on your own time. Run speed while holding a weapon or tool has been increased from 75% to 90% unarmed run speed. Although there may be other unknown issues due to the project migration, the only obvious change left to fix is the visual quality of the ocean surface. As it was not a priority, doesn’t affect gameplay and I wanted to get an update out ASAP, I left this for another update. The migration caused the visual settings of the water to revert and will take some tweaking. It may change drastically as the former ocean surface was somewhat of a placeholder. I know some of you were hoping for a larger update but this will be the start of much more frequent updates and I will address the issues and recommendations from feedback on this forum as a priority. Thank you to all who have taken the time to playtest Windstone and give feedback. A big thanks to those who donated and for the streamers and youtubers who helped bring more players to Windstone. Stay tuned for many updates more frequent updates in the near future. Update 12 can be downloaded from itch.io, as always. This update is primarily an optimization update. Nearly all models have had their poly count reduced dramatically and the landscape itself is optimized. The foliage has also been thinned out slightly to increase performance. The result on test computers is a 30% reduction in RAM usage and 30% reduction in load times. Results may vary on other computers but this should allow a much larger player base to test Windstone as previously a relatively high end computer was necessary. RAM usage should not exceed 8gb. It is still fairly high but much better than before and I will continue to work towards reducing this. The primary reason is that the entire world of Windstone is seamless. There are ways to keep the illusion of seamlessness while actually having sections of the island only load in when you are close enough to that area in a similar way that Ark: Survival Evolved works. As this version is being tested my primary focus will be integrating a similar “seamless” landscape loading system into Windstone. One major bug was also fixed where if you loaded a game without ever saving (essentially loading the very first auto save which happens when you first load into a new game after the intro text) all loot baskets would be empty. Originally posted @ itch.io. Download it here. Update 11 will be delayed due to unforeseen compiler errors. The newly optimized build of Windstone runs great on my end, but when I package it for distribution there are errors that cause the build to fail. I believe these errors are due to broken redirectors which are trying to find and load objects that have been deleted from the project. Once these errors are fixed I will upload the new build. It should not take more than a day or two. As always, you will find the latest version on itch.io, along with the list of what’s updated either on itch.io community page or on the forum. If you wish to support the development, go to https://www.kickstarter.com/projects/973066514/the-last-makaran-primitive-survival to back it!